Dundonald Bluebell celebrate promotion to the Super League. Dundonald Bluebell are celebrating a historic double after winning promotion and reaching a cup final within the space of just two days. 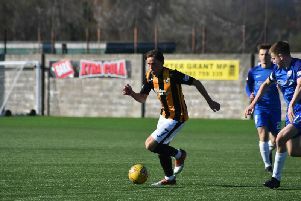 Bluebell travelled to Dundee Violet on Saturday in the knowledge that three points were required to clinch a top two Premier League place and a first ever promotion to the East Super League. The Cardenden men put any nerves aside to secure a comfortable 5-0 victory to spark wild scenes of celebration among the players, officials and travelling fans. Bluebell followed this up 48 hours later with 1-0 victory away to Fauldhouse United in the East of Scotland Cup semi-final thanks to a dramatic injury-time winner from Calum Young. Bluebell general manager Alan Halliday (below) reckons the achievements of the past few days rank as the greatest in the club’s 78-year history. “It’s the most successful week the club has ever had,” he told the Press. “The lads were excellent on Saturday in getting the job done and there were a few celebrations afterwards so it was a bit of a roll call on Monday to see who was fit. Bluebell will meet junior giants Bo’ness United in the final at Creamery Park, Bathgate on Saturday, June 11, kick-off 2.30 pm. “The big plus is that we’ve now got 10 or 11 days to recover before the final,” Halliday added. “It gives us a chance to get people fit although we’ll be missing a few players due to them having made prior arrangements. “Bo’ness are one of the biggest junior clubs in Scotland so we’ll go there as underdogs but with the team spirit our boys have I wouldn’t rule them out. Halliday, along with club chairman Doug Rogerson, took over the running of Bluebell in 2012 when the club was languishing in the regional South Division. A five-year plan was put in place to take the village club to the Super League, and with those ambitions realised a year ahead of schedule, the next objective is to consolidate in the top tier of junior football. “We got involved three and a half years ago and put Archie Wyse in as manager and he set us on the road to where we are today,” Halliday added. “After Archie retired, one of the players, Craig Morrison, took it on and has done fantastic for a young manager. “We also have a hard-working committee who deserve great credit, but most praise has to go to the players, who have played over the last two or three years to get us into the position we are in now. “It’s now a case of getting geared up for the Super League and our ambition is to establish ourselves in mid-table and take it from there. “There may have been a few squint faces when we came to Bluebell and said we wanted to take the club to the Super League but we certainly believed we could do it. “We had been successful at Glenrothes winning various cups and competing in the Super League and a lot of people said we were taking a step down coming to Dundonald.